As homebirth advocates have been forced to reconcile themselves to what everyone else has known all along — homebirth increases the risk of perinatal and neonatal death — they’ve been experimenting with rhetorical strategies to diminish the significance of these deaths. On Wednesday I wrote about Henci Goer’s effort to make homebirth deaths more palatable by comparing homebirth to amniocentesis. Other homebirth advocates emphasize that the absolute risk of death is low (true) or that only women having first babies are at risk for homebirth death (false). The argument goes something like this: Yes, 3 times (200%) as many babies die at homebirth as in comparable risk birth the hospital, but 3 times a small number is still a small number. Leaving aside for the moment that this is the same group who crowed over a 20% increase in homebirths from from 0.56% to 0.67% of US births, does dismissing the absolute number of death as low fully convey what is at stake in the decision to attempt homebirth? It seems to me that it does not. 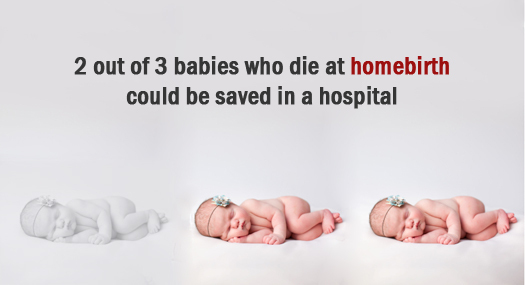 2 out of 3 babies who die at homebirth could have been saved in the hospital. 0 babies who die in the hospital could have been saved at homebirth. And that is a best case scenario. That’s what happens in a system where the midwives are highly educated, homebirth care is integrated into the larger obstetrical system, and the list of exclusion criteria long and detailed. None of those criteria apply to homebirth in the US, so the proportion of preventable homebirth deaths in the US is undoubtedly much higher. In other words, most of the babies who die at homebirth in the US could have been saved in the hospital, whereas none of the babies who died at the hospital could have been saved at home. This formulation makes a mockery of the claims that advocates make for homebirth. Obviously, if 2 out of 3 babies who die at homebirth could have been saved in the hospital, homebirth is not as safe as comparable risk hospital birth. Since 2 out of 3 babies who die at homebirth could have been saved in the hospital, trusting birth is a bizarre and deadly strategy. As 2 out of 3 babies who die at homebirth could have been saved in a hospital, living close to the hospital is not close enough. Since 2 out of 3 babies who die at homebirth could have been saved in the hospital, hiring an attendant who is trained in “normal birth” is not going to save those babies. Homebirth advocates like to claim that choosing homebirth birth means “taking responsibility” for the outcome. If that’s so, in 2 out of 3 cases of a homebirth death, the mother is responsible for the fact that her baby died. Unless and until homebirth advocates understand this reality, they are not making an informed choice of homebirth. I’m just wondering where you got these numbers? Can you cite the studies?